If you have multiple instances of the software installed on your system, use the Find MetaTrader button to get the correct version. Click the Install button and follow the steps on the screen, until the installation has completed successfully. Please note that the Admiral Connect extension is currently only supported for Windows. Admiral Connect is able to display your news feed in real time. 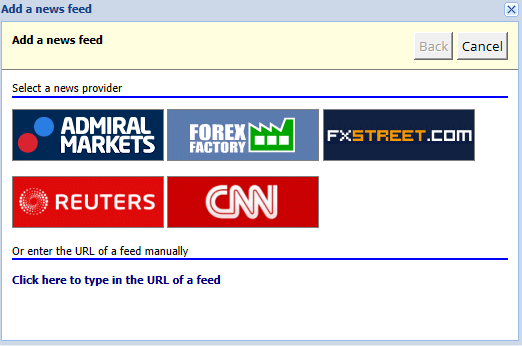 You can customise which feeds you want to follow, including a number of multi-language choices. You can add feeds as soon as Admiral Connect is active in your chart. confirm your choice by clicking the Add a feed button in the following interface. choose the appropriate feed out of the offered selection. For example, Jandaya is the name of the German feed. It is also possible to filter news feeds. For instance, you can choose to have Admiral Connect only display news that includes a specific key phrase. To do this, click the Add filter button at the top of the interface. If you want to set more than one key phrase, you can separate them with a comma. For example, a key phrase EUR/USD, GBP/USD will search out all news posts that include either EUR/USD or GBP/USD. Additionally, you have the option to set a sound alarm for news that includes your specific key phrases. If you want to remove any news feed, select it in the drop-down menu in the top-left corner of your interface. Click the Edit feed option and then choose Remove feed to get rid of it. 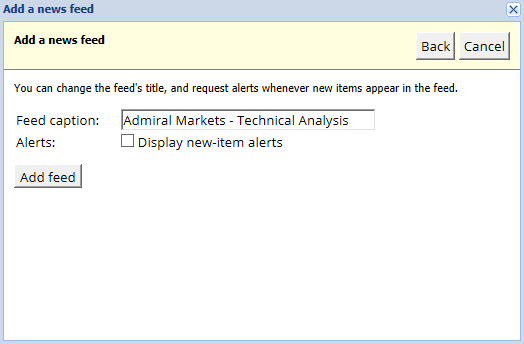 You can undock the Admiral Connect window from your MetaTrader. This will display Admiral Connect in a separate window, that can be dragged onto other monitors in case you use more than one. To do this, click the Undock window button at the top of your interface. To revert this change, simply choose the Re-dock window button that replaced the Undock button in the undocked window. The Deposit/Withdraw button at the top of the Admiral Connect interface redirects you to the Trader’s Room in your browser. Trader’s Room allows you to conveniently issue withdrawals and deposits. 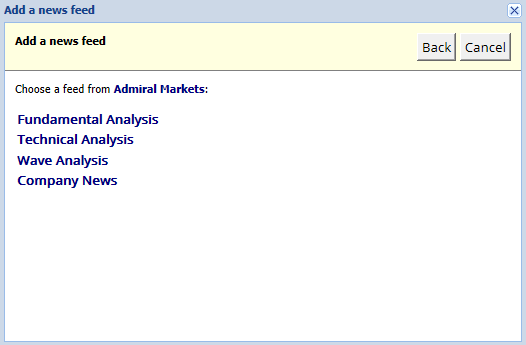 Admiral Connect allows you to analyse your trades and improve your trading strategy based on the results. It displays your strong plus weak areas and offers unique insight to help you with your trading decisions. 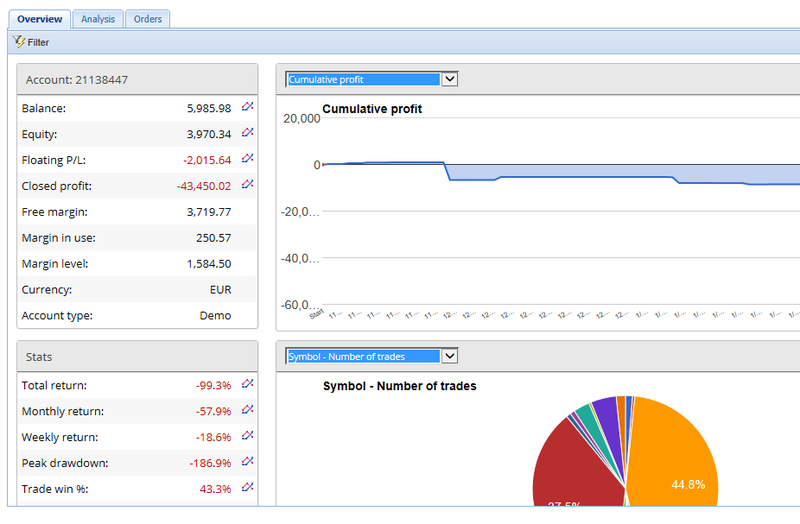 The Overview menu displays information about your entire trading account. Several diagrams and graphs complement the data available here. You can get immediate information about account balance, equity, open positions and profit/loss etc. Note that there is a scroll bar on the right side of the window, which allows you to display more information by scrolling down. The Orders menu shows a detailed history of your completed orders. This includes every order you have done in your trading account. Additionally, you can use the comprehensive filter functionality to search for one or several specific trades. You can set your own conditions and criteria, such as a specific time-frame or a minimal volume. Note that multiple pages of orders are displayed if applicable. Use the arrows at the lower end of your Admiral Connect window, to access additional pages. This displays the top movers of the day and allows you to compare them. For example, you can compare them to yesterday’s top movers. This should set all your EAs to whatever language you want. Is this extension available for MacOS? No. Is this extension available for MT5? No. What do I do when free trial period runs out? If the message To continue using Supreme Edition, please apply for real account is displayed in your EAs, the 30-day trial period for Supreme has run out. In this case, feel free to contact our customer service. We will gladly unlock unlimited Supreme for your demo account. Feel free to visit our YouTube channel for recordings of our webinars about daytrading, the Supreme extensions and general handling of the MetaTrader 4 software.